Over the weekend the club was honoured to present Erika Bonneywell with a portrait to commemorate her election as a life member and to thank her for all of her scoring and support of the club over many years. The portrait was undertaken by local artist David Drury and depicts Erika at the ground. Some pictures of the presentation may be found here. Woking and Horsell Cricket Club would like to reiterate their gratitude for Erika's service over the past 20 years and look forward to her association with the club for a long time to come. Photos of the WHCC Family Fun Day are now online. You can view the gallery here. The day was a resounding success and we are currently looking into hosting the event again in 2010. Watch this space! The new nets are now complete! After 5 days of fortunate weather the nets were able to be finished on time and within budget. A very big thank you to Steve Wernberg for putting the effort in to get the construction organised and keep it managed. Thanks also to our tireless groundsman Charlie Johnson, who was instrumental in facilitating the works throughout the week. The new nets include a full length track with proper bowling run-ups. As an added bonus the existing nets have now also had bowling run-ups added as well - it's even all marked out! 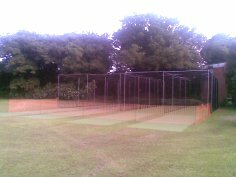 The nets should be ready for use in the next few days. You can find some photos of our fantastic new facilities here. Woking and Horsell's 20/20 XI had an excellent start to their Frank Binks campaign last night with a thumping 65 run win over the Woking XI. An early blitz from Malcolm and Jerry saw the team hit the heights of 56 for 1 off 5 overs and after a small middle order blip some cultured hitting from Charlie and Digby towards the end enabled us to post a total of 157 for 6 off 18 overs. Tight bowling from the start - Henry Peters opening up with a maiden - ensured that the oppo were always well below the run rate and as a result wickets fell regularly. Charlie added 3 wickets to his runs with Damo and John taking 2 apiece aided by some fine catching. Woking XI ending up 92 all out (full match report to follow). Thanks to all those of you who contacted me about playing in this years Twenty 20 tournament. Sorry to those of you who have not been picked, but it was nice to be over subscribed for a change. We have two more games left at least on 17th and 24th June so let me know if you are available for them as well. Those two games are at home and the bar will be open so if you are not playing why not come down and watch whilst having a well earned drink. This Wednesday we are away at http://www.oldwokingcc.co.uk/ starting at 6pm, all support welcome. Overseas Player in arrival before June shock! I am pleased to announce that the club's overseas player for 2009, Digby Philip, has arrived in the country. Digby was recommended to the club by former player Glenn Morley, who has played with Gisborne, New Zealand. Opening the bowling, he made an impressive debut last saturday picking up 4 for 38 and clearly ruffling a few Valley End feathers. If you see Digby around at the club on Tuesday or Friday nights or at the weekend why not introduce yourself and make him feel welcome? Colts wicket keepers get helping hand, or should that be glove?